Synopsis: The first in a series of three books about the the history of the world as related in the scriptures, The First 2,000 Years and the subsequent volumes are veritable masterpieces that retell the story of mankind in a way that is strictly faithful to the scriptures. 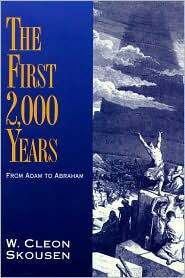 This volume covers the beginning of the world until the end of the first 2,000 years of human history, or from Adam to Abraham. Strong Points: A fascinating read that puts things into a very interesting perspective. W. Cleon Skousen had a gift for making the Old Testament readable and interesting, even in places where it might not seem so. There are many points in the book which bring up concepts that a reader of the scriptures likely missed. The best part is that it brings the scriptures to life for the reader while staying very faithful to the scriptural text. Weak Points: This first volume in the series, though keenly interesting, probably takes the most liberties from the text of the 3 books (which is not much, since the books are great for staying true to the course of the scriptures). Also, in this volume Skousen concludes that Melchizedek and Shem were not the same person, a conclusion that I do not agree with and that has much evidence to the contrary.